The latest installment in the Billionaire Brothers series features a secret baby! Gaaahh not one of my favorite tropes, that’s for sure. I already knew the father of Sydney’s daughter when I was reading the first book, Everywhere and Every Way, so it wasn’t a shocker to me. It wasn’t revealed in that book, but it was quite obvious based on Sydney and Tristan’s non-interaction. The chemistry is off the charts, though! 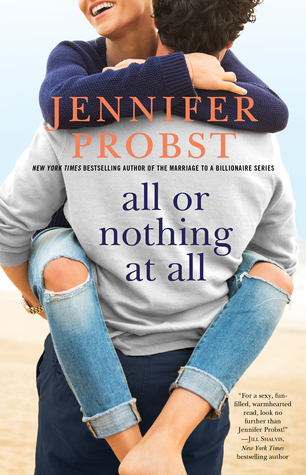 Jennifer Probst can create a believable and steamy romance and for this, I was able to finish this book. Add to that is my dislike for Tristan. I liked Caleb and Dalton, but I had a hard time warming up to me. I also do not get why this book was the last when the second book Any Time, Any Place already revealed the mystery surrounding their mother when it was the second book. It would have been better if this was the second book. I have to be honest though, this is one of my least favorite in the series. I still need to read Somehow, Some Way a novella that happens in between the second and third book. I’m not a big fan of the secret baby trope either…and I still haven’t started this series. oops! Glad to hear the chemistry was on point even if the book wasn’t amazing! Lovely review, Zeee! Crystal recently posted…Pass the Popcorn: Hush, I’m trying reading Mr. Right-Swipe!